There are many ways people make you feel guilty on the internet. But one of the most recurring is when you use a service like Spotify to get your entertainment fix. It's not as though you are doing anything wrong: you pay a monthly/annual fee, or perhaps 'pay' by putting up with a barrage of irritating ads, and in return you get to listen to your pick of millions of songs. All fun fun fun so far, then someone – often someone who hasn't really used the service – will pipe up: "You do know the artists get paid nothing for this". That someone this month was Thom Yorke, arguing that streaming services don't pay bands enough and are hurting new artists. But next month it may well be a colleague berating your digital music library as they smugly put a freshly bought CD into their computer, forcing you to listen to the whirr of the disc that proves they have spent money on an actual real thing. This relentless guilt-tripping doesn't really make anyone want to spend more on music or films - but maybe there is a way to make real guilt work for the better. What the internet needs is a Feeling Guilty button. Something to press when you have listened, read, watched, used something on the cheap and loved. A place to tap when you have pilfered a thing for free, whether be legitimate or illegitimate means, and it has stayed with you. It's not a button you would necessarily use regularly - but if it was there it would be used. It would be used when you buy a movie for less than a cup of coffee and it changes your life. It would be used for the album that sails up your Spotify most-listened to in the first week of release. It would be used for the out-of-copyright book you found on Project Gutenberg that you didn't want to end. It would be used because, underneath our cheap exterior, we all still care about things that really mean something to us – even if we now practically get them for free. It's hard-wired in us to seek out a bargain and this will never change. The internet has been the great leveller in finding cut-price content and if there are a thousand sites offering the same thing we will inevitably go for the cheapest. That, or seek out a way to get it completely for free. This is the way it should be – money is tight and we all want to get good value for our hard-earned. 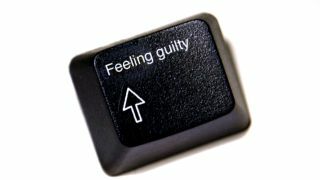 But when the value outweighs the money you spent: that's when the Feeling Guilty button comes in. Press it and you can donate cash/Bitcoin/beans – whatever the cool kids are using for transactions these days – to the maker. A payment after purchase would mean that sites can continue with their cut-down pricing, determined by seasonal market fluctuations and other fun factors that bore even economists to tears. It would put the buyer in charge and give the maker a sense of worth. We are all guilty of not caring enough for what we digest digitally. It's a bi-product of the all-you-can-eat world we live in and we can't rely on the services we subscribe to to change this for us. Netflix isn't suddenly going to turn around and take movies and TV shows away from us as we are consuming too much. It will be the opposite. It will pile on more content, with the hope that we will watch more for our monthly fee, which in turn spreads the money generated from its streams even thinner. The Feeling Guilty button could be the ultimate top-up service, powered not just by cold-hard cash but goodwill too. It's something that, when pressed, could make us all a little bit richer.